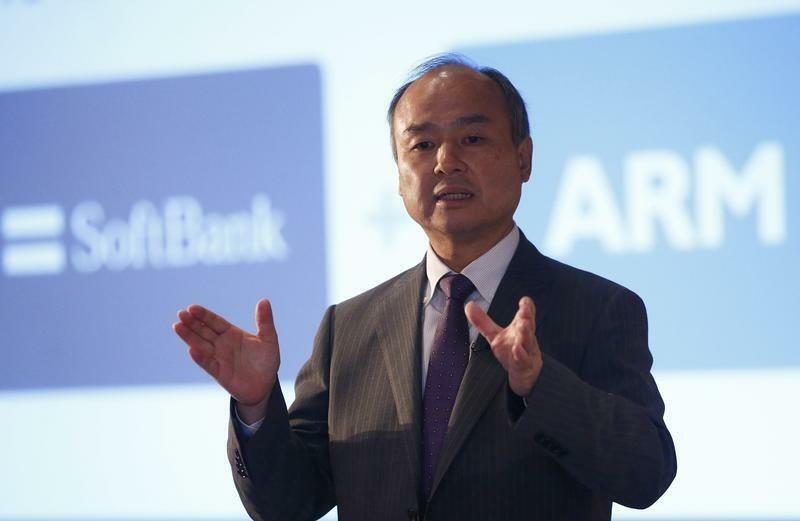 TOKYO (Reuters) - SoftBank Corp (9984.T) founder Masayoshi Son, who created a $68 billion tech investment behemoth from a $50,000 start-up, has divided investors and analysts with his latest "crazy idea", the $32 billion acquisition of chip designer ARM Holdings (ARM.L). Visionary, risky, or both, the deal announced on Monday caught them all on the hop. But in the way it was struck and presented, they all recognized the signature style of the man whose chutzpah led to successes like early investments in Yahoo! (YHOO.O) and Chinese e-commerce company Alibaba (BABA.N), which briefly made him Japan's richest man. Many investors had been hoping Son would use cash from recent asset sales to buy back shares or pay down its hefty debt, so SoftBank's Tokyo shares were hit by a glut of sell orders on Tuesday morning, trading down almost 11 percent. "A fresh acquisition is not what the market wants from SoftBank," said Mitsushige Akino, chief fund manager at Ichiyoshi Asset Management. "It's Mr. Son's style to keep expanding, but isn't he stretching too much?" Investors fret the purchase of ARM, Japan's largest ever outbound deal, may be too much for SoftBank, still in the throes of turning around U.S. carrier Sprint (S.N) and tackling a $112 billion debt pile. Others take the longer view. "There is little synergy with SoftBank's existing businesses, but it makes sense if we look at ARM's future potential," said Tomoaki Kawasaki, senior analyst at IwaiCosmo Securities Co.
"Mr. Son is prioritizing investment for the future over shoring up the balance sheet. It's very Mr. Son-like." A self-made entrepreneur whom one investment banker described as thinking "in decades", Son, of Korean descent, has long been something of an outsider in corporate Japan. He wears the somber suits of Japan's salarymen but is an outspoken sometimes outrageous voice, with a celebrity status and 2.5 million followers on Twitter. Selling his ARM deal to investors and analysts in London on Monday, he quoted Yoda, the diminutive Star Wars Jedi Master, with an urging to "listen to the force", and told them Jack Ma, founder of Alibaba, had called immediately to discuss a partnership. Until last month, Son, known as "Masa", had been on the way out. Instead, the 58-year-old abruptly scrapped retirement plans and said he would stay on to create "SoftBank 2.0" and work on "a few more crazy ideas". When presenting the ARM deal, he breezily dismissed his doubters. "If the investors do not like it, they will sell," he said. "I am the largest shareholder in SoftBank; I share the same interest as the other shareholders." Kazuyuki Terao, chief investment officer at Allianz Global Investors Japan, was among the skeptics. "It's hard to see returns that justify the more than 40 percent premium, or synergies with its existing business," he said, adding that it could hinder short-term profit growth, though longer-term gains were possible. Son said he sealed the deal in just two weeks with a handful of advisers. These include Jeffrey Sine, co-founder of niche U.S. merchant bank Raine, who has advised Son for years. He did not have the input of his once hand-picked heir, the more circumspect former Google (GOOG.O) executive Nikesh Arora, who stepped down last month after Son decided to stay on. Arora had been credited with streamlining the SoftBank portfolio. "The deal was done quickly, without debate, but that’s how Son-san always does these things," said Masayuki Otani, chief market analyst at Securities Japan Inc. Son, who holds a 19 percent stake in the company, said investors should capitalize on what he called a "paradigm shift" in technology. ARM, he argues, will be central as the world moves to connected gadgets. That struck a chord with some. "Japanese companies are often too cautious to take decisive action, but Mr. Son is different," said one retail bondholder, a 72-year-old pensioner who declined to give her name. "That’s why I bought the bonds. I want to support his challenging spirit." Even so, the deal carries significant risks, especially if it distracts Son and top management from resolving the Sprint headache. It has turned in loss after loss since acquisition in 2013, though he told investors on Monday the group would soon break even. "To us, the ARM acquisition announced yesterday appears largely inconsistent with Softbank's investment strategy," said analyst Atul Goyal at Jefferies, adding it was unclear how ARM, already trading at a premium, would benefit SoftBank investors. "It does not inspire much confidence and requires deeper review."